The thing about the foot is that, it is too way down under, it receives all the weight and pressure of the upper body but is often neglected by most people. You might say, “Oh no, I sure take notice of my feet. I buy only fancy shoes for them.” Well, you do indeed, but you do it mostly because you want to cover them and to look beautiful when around with people. There is nothing wrong with being trendy and pretty (or handsome) – no one can deny you have the right to look good. Yet, here is the thing, keeping up with the latest fashion trends about shoes should not compromise the comfort and health of your feet. You do not want ugly callosities propping up on your feet any time soon because of uncomfortable footwear. Aside from calluses, another common consequential disorder wrought by wearing ill-fitting shoes is the pump bump. So what is a pump bump? If you feel a hard bulge at the back of your heel and is often painful, then that is a pump bump – medically called as the Haglund’s Deformity. 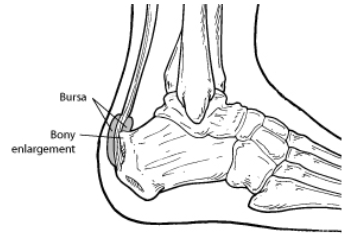 What makes Haglund’s Deformity painful is that, because there is a bony stuffing on you heel bone, it causes the soft tissue around the Achilles’ tendon to get irritated when it rubs against the shoe. This scenario can result to another ailment called Bursitis, which is the inflammation of the bursa (a sac with fluid located between the bone and tendon). Any shoe or footwear that has a rigid back inside can cause pump bump. The rubbing effect it does to the back of your heel triggers the bone to compensate with the pressure by growing a bump. Example of such shoes are women’s pumps (high heels), men’s formal shoes, ice skates, and roller skates. Over-supinated foot (a foot that rolls too much on the outside when walking or running) – the opposite of the condition called overpronation. The best person to consult with if you want to get rid of that painful pump bump on your foot is the podiatrist. The podiatrist or podiatry specialist is a medical professional who specialises on foot health and lower limb conditions. Custom orthotics – to support the arches and control the motion of the foot. In a more serious case of Haglund’s Deformity, the aforementioned treatments may not be sufficient to supply rectification. In such a scenario, the podiatrist may recommend a surgical solution. Seeking an early diagnosis and treatment from a competent podiatrist upon the initial onslaught of a bump on one of your heels can prevent a progression of Haglund’s Deformity. For adults and children, 5 years of age and up, it is a good practice to have a yearly foot check with your local podiatrist to address any foot disorder, such as a pump bump, early on.